The W.O. Smith Junior Advisory Board & The Phoenix Club are excited to present Nashville’s premiere 2018 New Year’s Eve party. Last year's event sold out well before New Year's Eve, and we're making the necessary improvements to ensure that this year's event is bigger and better! 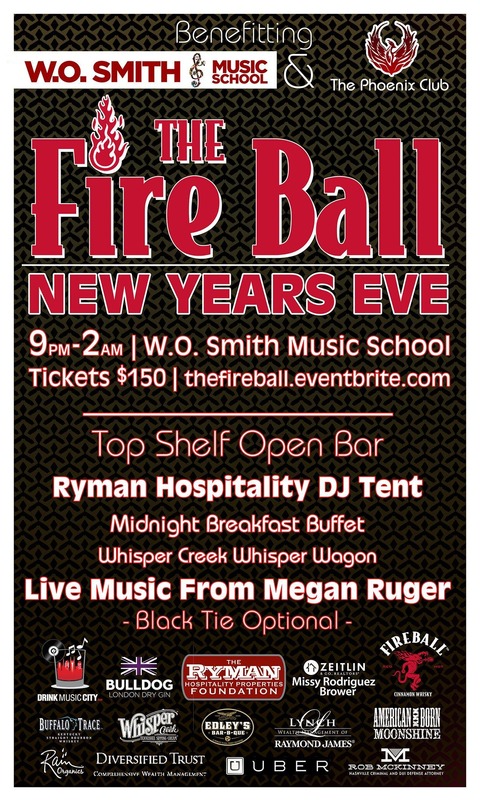 Fire Ball NYE 2018 promises to Ignite the Night. Live music from BandLux & DJ Benji under the tent will make this an event you don't want to miss. Hors d'oeuvres provided by Fresh Hospitality (Taziki's, et. al.) will be served throughout the evening. At midnight, The Party Fowl Nashville Breakfast Buffet will open to cure any late night cravings. And Tin Can Photos will be there snapping pics in an old school VW Bus. Tickets are available for $150, while supplies last, so make sure you buy your tickets early. All proceeds will benefit the W.O. Smith Community Music School and The Phoenix Club. About the School: Since 1984, W.O. Smith Music School has been providing music lessons to low-income households for 50 cents a lesson. Starting from humble grounds with a mere 45 students, W.O. Smith has grown tremendously to support over 400 students today. In spite of its low-overhead and volunteer faculty, the W.O. Smith Music School must still raise funds to cover its annual administrative and operational expenses. It relies on fund raising events, foundation and corporate grants, and contributions from individual supporters.